India installed around 16 GW of new power capacity in 2018 with more than 8 GW of the capacity coming from solar energy marking a new milestone for the country’s solar development which is progressing by leaps and bounds. The rest of the capacity was composed mainly of coal and a bit of wind energy. 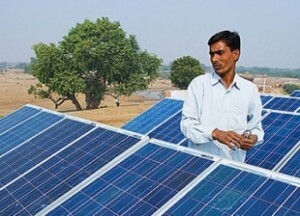 Despite crossing the 50% market share, solar capacity addition was around 15% lower than from 2017 as solar power construction was affected by issues such as the safeguard duty on imports of solar panels from China, new GST rules as well as the perennial issues of land acquisition, transmission capacity as well as the poor health of the distribution companies. What was again remarkable was the sharp 66%% increase in rooftop solar capacity which really came into its own this year and marked a historical tipping point for this sector. Despite the cumbersome regulations and reluctance of the distribution companies to promote rooftop solar energy systems, the sheer economic savings from rooftop solar energy systems has made industrial and commercial customers go the whole hog in installing rooftop solar energy. With commercial and industrial grid price of around INR 8-12/kWh in most parts of the country, there is a 50-75% saving when installing rooftop solar energy which can be bought at around INR 4/kWh from a large number of PPA players in the country. The ground-mounted segment showed around 6.7 GW of installations this year which was down almost by 25% from last year as there were challenges due to many of the authorities putting price caps on tenders and sometimes canceling the auctions outright if they found the price to be a bit on the higher side. There was also major disruption due to the legal and regulatory uncertainty of the pass-through of the safeguard duty effect as well as what GST to charge on what part of the solar power plant. Many developers also went slow as the safeguard duty is imposed only for two years and it makes sense to buy solar panels at the fag end of their installation time when the price of the panels is unaffected by the safeguard duty. In the coming year, solar capacity in India is expected to skyrocket to more than 10 GW as numerous tenders floated by different state and central organizations start to get executed this year and the safeguard duty rates ramp down from 25% to 20% and then to 15%. The solar industry has also become slight mature with many of the small developers exiting the industry and large developer such as ACME, Azure, Softbank, Renew, Adanis dominating the industry. This is allowing better execution of projects.